This experience of painting as a group was about letting go and allowing the piece turn out in a way that we could each only partially control. It encouraged us to respond to a series of paintings in various states of completion. The painting whispers what it wants you to do if you listen closely. Sometimes I painted a lot on the works in front of me, and other times, I needed to use a soft touch because most elements of the painting were working already. If you are an artist, grab a group of artist friends and try this. It is a really interesting exercise! Convergence Show is happening soon! I’m finishing 2015 with a very special show at Gallery on the Pali (2500 Pali Highway – driveway accessed via Niolopa Place). “Convergence” runs from Dec. 6, 2015 – Jan. 7, 2016, with an artist’s reception on December 11, 6 – 8 pm. Please see the postcard below for all the details. I would love to see you there! Some of the guests at Oahu Open Studios requested that I bring my mugs, bags, and cards to sell at the event, so I will have them with me at the reception in case you missed the chance to get the one you wanted at Oahu Open Studios. 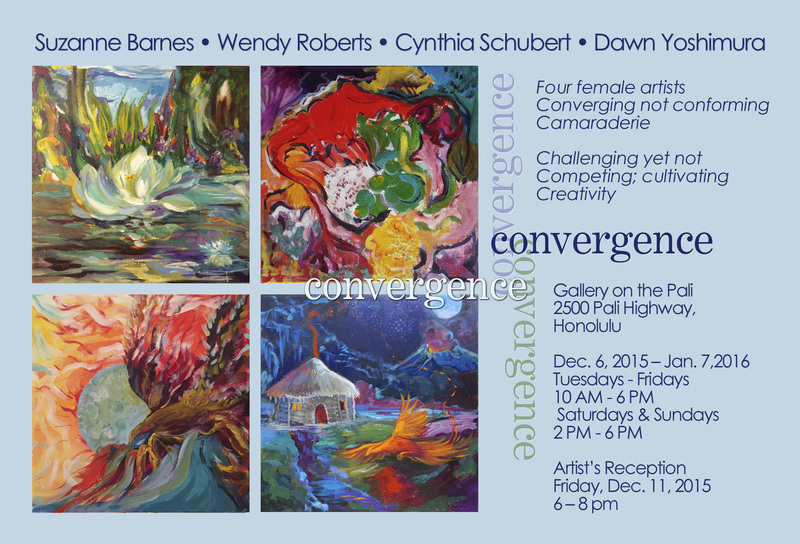 Four award-winning artists, Suzanne Barnes, Cynthia Schubert, Wendy Roberts, and Dawn Yoshimura have produced ‘Convergence’, a collaborative art exhibit, showing at the Gallery on the Pali opening December 2015 through the first week of January 2016. The show’s theme was created during weekly get-togethers, where they brainstormed about their similarities and differences. All four women are painters who currently live in Oahu, but vary in their chosen media, age, and geographical origins. This convergence of four creative minds led to the title of the show. They endeavor to challenge each other in a supportive manner. Additionally, they have worked on projects in parallel to explore their individual answers to the same questions. Suzanne, born and raised in New York City, had an inherent interest in both art and science. She became a physician but never abandoned her love of art. She squeezed time in for both her art and her medical practice in Wisconsin for many years. Since relocating to Oahu, she is thrilled to finally have the time and energy to devote to her passion. Cynthia spent her early life on the move as a military child, later choosing to live close to the ocean to facilitate her husband’s work as a marine biologist. 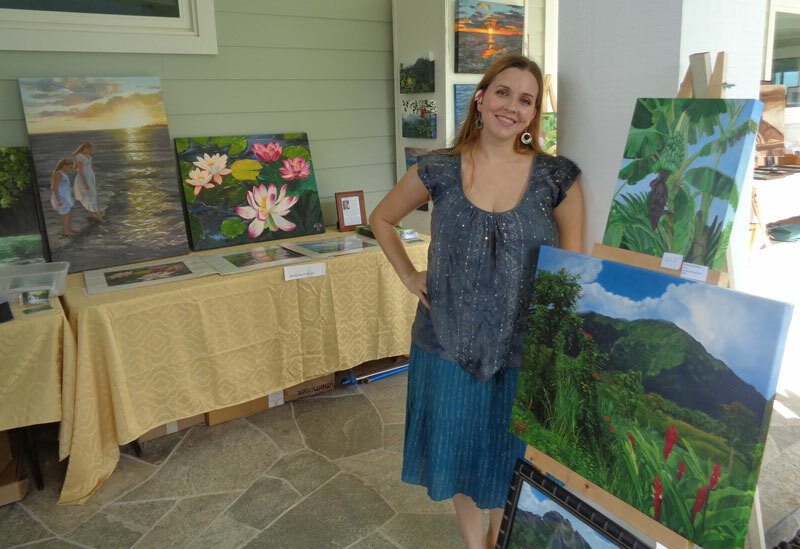 She has lived on other small islands such as Puerto Rico and Guam, hence her art business is “Art from the Islands”. Wendy grew up on a farm in rural Utah. Her father was the skilled quadriplegic artist Wendell Johnson, who taught her to paint as soon as she could hold a brush. She has moved with her family to several locations across the U.S. as her husband gained his medical training, finally settling down in Oahu in 2010. Dawn, born and raised in Hawai’i, grew up in Kaneohe, studied art in the Bay Area in California, and now lives half the time in Sweden. Bilingual, she has an active art career in both locations. With these outside experiences, each artist has a unique viewpoint and a connection to a variety of cultural influences that shine through their work. It is the process of sharing these histories and the various influences that inspires them. This show is about process as well as product. When artists with very diverse data sets of knowledge get together, the result is often innovative and can even be surprising. Please note: The gallery is located in the First Unitarian Church of Honolulu. The driveway is accessed from Niolopa Place. The public is welcome to an opening reception on Dec 11, 2015, 6 pm – 8 pm.